Great Terrain and Family Oriented! 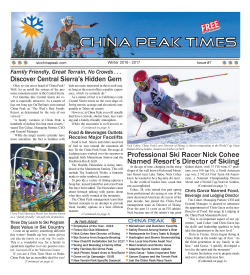 Why ski China Peak? Glad you asked! The mountain is quite possibly the best kept secret in the Sierra. It is a fact it is the only Central Sierra resort on the west slope offering terrain, acreage and elevations comparable to Tahoe ski resorts. However, you’ll find fewer crowds, less waiting and a family-friendly atmosphere. While the mountain is well known to Central Valley riders, Central Coast skiers and boarders should note that it is just a four hour drive from the coast from Palo Alto to Pismo Beach. So get excited, wax your boards and make a reservation. China Peak is here for ya! Let’s talk about the mountain. With a base at 7,000 feet and a top of 8,700 feet, this place can get a ton of snow. China Peak has great overall structure. It offers a drop of nearly 1,700 vertical feet. Plenty of lifts get skiers around the mountain, including three moving carpets in the beginner area, as well as three double chairs and four triple chairs. One terrain park, Tollhouse - is served by Chair 4 and is the most popular. Here riders can go big without worrying about people dropping in on them. The mountain’s skiable vertical rivals the Tahoe resorts like Alpine, Northstar, Sierra and Sugar Bowl. You can give your kids some mileage for a warm up on a top-to-bottom Green run, down the 2.25 mile long Academy run. Off Academy there are multiple options for Blue runs, Black runs and some exciting tree skiing. Now that everyone is warmed up you can try the other 44 trails that cater to every level, from novice to expert. Most trails are designed for intermediate, advanced and expert skiers and snowboarders. What about the crowds. What crowds? China Peak is known for short lines and open terrain. The challenge is having enough energy or stamina to keep going all day. Speaking of energy, China Peak has 10 restaurants at the resort that satisfy every hungry appetite, from pizza to fine dining. Drinks are available at Sully’s, Jack’s, Buckhorn, the new Base Camp and JW’s. Once its time to rest. Why not stay nearby to get a jump on the day when the lifts open at 9 a.m. Lakeshore is about five minutes to the north where there are cabins and condos. Twenty miles to the south, the community of Shaver Lake offers many lodging opportunities. And don’t forget about staying right here at The Inn at China Peak. The Inn at China Peak is comfortable and cozy. Many rooms have their own bathrooms. However, dorm style rooms with a shared bathroom and shower facilities are available for the frugal. Suites options exist. The Inn now offers huge savings on midweek packages including rooms and lift tickets, which you can see at skichinapeak.com. Kids 5 and under ski for free. The staff is friendly and enthusiastic about assisting their guests. 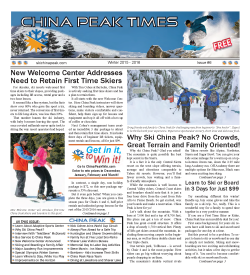 Also, China Peak is one of the only mountain resorts in the nation to allow on-site RV parking. Now that you know the answer to “Why ski China Peak?” you have no excuse for not planning a trip in the near future. There are some ticket specials for all active duty and retired military personnel (and their dependents). They can purchase all day lift tickets at half off the regular rates. They are valid any day, including holidays. Ski or ride for half price on your Birthday. Must present photo ID with date of birth. Not valid on holidays. You can always check out resort details at SkiChinaPeak.com or call (559) 233-2500. 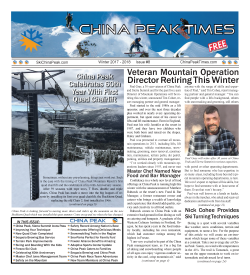 You are cordially invited to be a part of the annual China Peak Times. 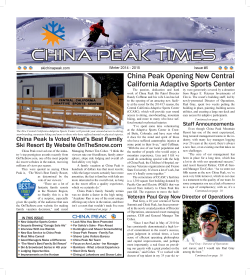 It is the participation of organizations such as yours that allows the thousands of visitors to the China Peak Ski Resort to learn more about what’s new for the upcoming season and where they can “play, dine and stay”. This publication has become a well received source of Fresno County Sierra Nevada winter sports information. Local, regional and national advertising partners have experienced a very good response rate to their sponsorship of the China Peak Times. 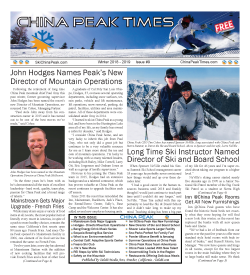 The China Peak Times is published by Talahi Media Arts in Prather, California. It is a full color newspaper, printed on 35 lb. stock. The page size is 12.5” x 11”. There are typically 32 pages in each edition. Around 25,000 copies are printed and distributed between Thanksgiving Week and the end of ski season (usually mid-April). Distribution is through businesses in Huntington Lake, Shaver Lake, Auberry, Prather, Clovis, Fresno and others in Central Valley. The advertising rates are listed below. All advertising is accepted on a first come, first served basis with no guarantee of page placement. Ads will be prepared for you at no cost or you can submit artwork to us at ed@talahi.com. The deadline for advertising copy is October 31. Rates for the next edition will be available in July 2019.